Hip Baby Blog: The Learner training pant. Potty training (we're in the middle of it with our daughter!) is an interesting time to say the least. It's a time for a "team" approach and patience as you witness the little accidents become successes. 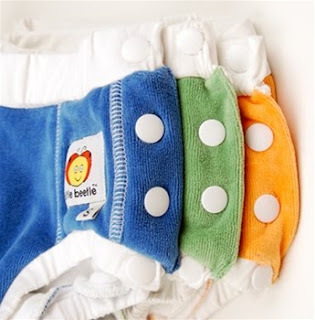 And the Learner from Little Beetle is a great way to assist you in making the transition from a diapered child to an independent child. These training pants are not only made from organic cotton velour, just about the softest fabric for your toddler's skin, but they are pulls-ups with the added feature of snap closures on both sides. So you can Pull-'em-on, Snap-'em-off. This is a valuable feature when the poop accident happens; no need to pull down the pant while spreading the mess on the legs, you only need to "snap" off like a diaper and voila! If you need added protection simply add a diaper cover on top. And did we mention how cute the colours are? Trainingly available at Hip Baby. We also feature other styles of training pants from Bummis and Bambinomio.